My husband is a pretty typical outdoors man – he loves camo, hiking, four-wheeling, and dirt. He prefers to keep a full beard and someday hopes to let his hair grow long again (though I’d be okay if he passed on the man-bun hysteria). Like many men, he’s not overly chatty unless you ask him the right question. Start talking lawn care, trucking, or LEGOs and he’ll talk your ear off. Aside from that, however, I wouldn’t consider him particularly communicative. Honestly, not many of the men in my life are. Unfortunately, there seems to be a number of authors who are less concerned with how men actually talk and more concerned with how they would like men to talk. Nothing screams “author intrusion” like a lumberjack waxing poetic about the flaxen hair of his soulmate. Yes, you may find a rough and ready, hands-on man who has a softer poetic side, but let’s be honest – most men will use two words when they should probably use ten. 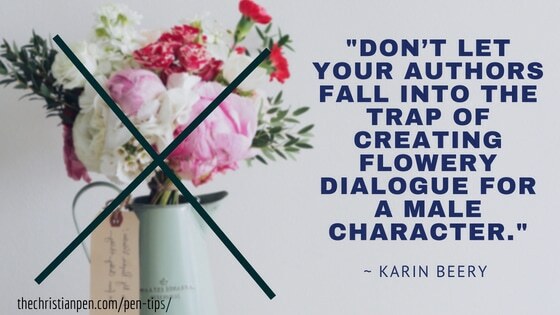 Don’t let your authors fall into the trap of creating flowery dialogue for a male character just because they think it sounds romantic or because it’s an easy way to include backstory. It’s unfair to the reader when the men become props instead of multi-dimensional characters. To fix that, here are six tips for helping your clients create more realistic dialogue for male characters. Know his passions. My husband will pretend to talk about football, but he couldn’t care less (I don’t think he actually watched a game until we got married). But, like I said earlier, he’ll talk for hours about LEGOs. It’s okay to have heroes who are chatty at times, but make sure it’s about those things they care about. Make it active. Men don’t sit and talk over coffee the same way women do. Instead, they’ll go fishing, watch the game, or fix the car together. They’re active communicators, especially with each other. It’s one thing to show a man and woman talking over dinner, but men talking with men should be shown in more realistic, active ways. Be efficient. I joked about it earlier, but it’s true – men rarely use ten words when one will do. That doesn’t seem to stop authors from writing paragraphs (or pages!) of their male characters offering every detail about their days at work. There does need to be some suspension of reality (to let the characters tell their stories), but not at the expense of having the men provide information like women. Embrace the silence. Women like to talk through their problems, often working out solutions as they converse. Men speak for specific reasons. It’s not usually a part of their problem-solving process. They don’t need to (or want to) give voice to every thought that pops into their heads. Male characters shouldn’t either. Body language. Unless it’s a romance and the hero is trying to woo the heroine, it’s doubtful that he’s going to sit across from another person and look him/her in the eye while they talk. Instead, he’s more likely to sit next to someone or fidget during a conversation. Solve problems. Men are problem solvers. If you tell them your problems, they’ll offer solutions. In fiction, however (especially romance novels), they listen and commiserate. There are certain situations when that can work (when the hero’s trying to get on the heroine’s good side), but not throughout the entire novel. Does this mean a male character can never sit across the table from someone and talk over pizza? Of course not! Do all of the men need to give one-word answers? Absolutely not. There are always exceptions, and fiction does require some level of suspended reality, but you should hear warning bells if you see all of these issues in one of your clients’ manuscripts. By being aware of these male dialogue pitfalls, you can help your author create more authentic male characters by helping them sound like real men. A lifelong resident of Michigan, Karin Beery writes contemporary fiction with a healthy dose of romance. Represented by literary agent Steve Hutson at Word Wise Media, her first book releases September 15 from Elk Lake Publishing. When she’s not writing fiction, she edits at Write Now Editing. 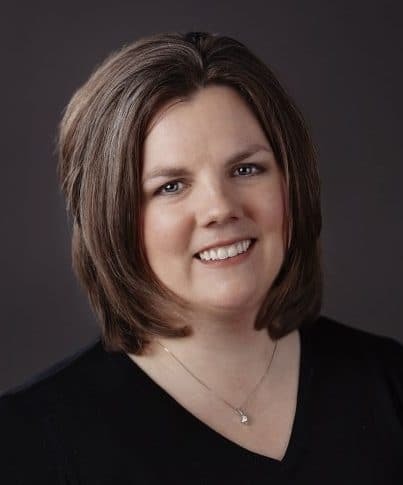 When she’s not doing either of those, she teaches Substantive Editing for Fiction and Romance Editing through the PEN Institute. You can connect with her on Facebook, Twitter, Instagram, or at her website, www.karinbeery.com. Click here to sign up for her monthly newsletter and receive the FREE, unpublished prologue to Summer Plans and Other Disasters!